BNL’s PTZ bearing mechanisms have been adopted by market leading OEMs worldwide, who recognize the advantages of combining different components and functions to realize weight and cost efficiencies. BNL can offer our CCTV customers 2 options. An off-the-shelf, universal CCTV mechanism or a custom fit, innovative and integrated bearing solution to fit your exact requirements. An off-the-shelf product that includes premium design features with no tooling cost. 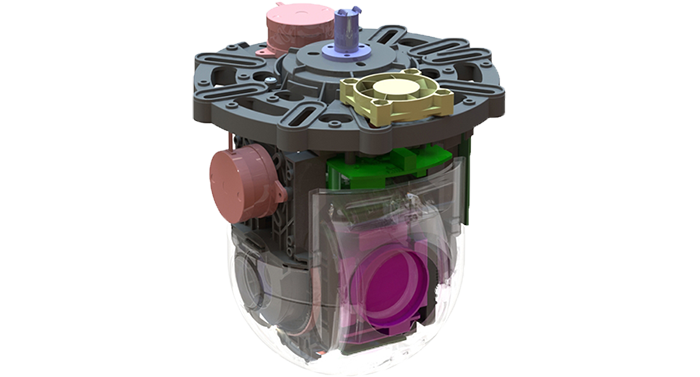 BNL’s plastic bearing pan and tilt mechanism is compatible with the majority of accessories and components used by OEMs. 1. Specially devised to work with the most popular camera, motor, fan and slip ring sizes, it is also adjustable to fit many different sizes and shapes of housing. 2. The molded design integrates molded clips, brackets and mounting features for easy installation and maintenance. BNL designs and manufactures custom molded CCTV PTZ bearings, which integrate features and functions for air management, snap-fit ability, cable management, PCB board fitting, slip rings and drive systems. Our innovative PTZ designs have allowed our customers to develop compact, lightweight products that are custom-designed to their individual requirements that save time and money.